This is going to be a long post, don't say I didn't warn you. Why is it every year when I say that I'm not going to bake any Christmas cookies something always happens and I end up making even more than I thought humanly possible? This year I even got the perfect excuse- I got sick the week before Christmas. Perfect excuse?! Yeah, right, said no mom ever. So, as I said, it is my fault. But, still when 5 people ask you if you'll be swapping cookies this year and your daughter goes all puppy eyes on you, well...there is nothing you can do, is there? Nothing, except cookies that is. What does that have to do with how to make cookies without really trying then, you'll ask? I'm getting to that. Overall, this year I made ( by my calculations) 17 lbs of sweets in a single day. When I finally sat down and looked back at the 16 trays of cookies on the counter, the boxes after boxes, I realized that I not only beat my record from last year ( hell, yeah!!!) but I have completely lost my mind in the process. Can you believe that someone, somewhere is so crazy to make 17 lbs of sweets?? If somebody told me that would be me this year, I would have told them they are nuts. Who's the nut now, huh? What surprised me the most was not that I managed all that. I am pretty aware there is very little I can't manage, if anything ( yеah, modesty is not one of my strongest virtues either). What surprised me was how little effort I actually put into it. So, I decided to make a list of the things that made my life easier, when it came to baking this year, hoping it will be of use to someone who is planing on going all out on the Christmas baking this or any other year for that matter. No. 1 Get an elf. No, seriously. You can't possibly think you can bake as many cookies and not have anyone help you. It's insane. This girl stuck with the baking for the whole 6 hours it took us! I couldn't believe it, but I was so happy about it. I have to admit without her help ( and she really worked!) I couldn't have made it. Make a list of the cookies you'll make and then approximate the time it will take you to finish them. You would be surprised how many recipes I skipped simply because they were too time consuming. When I am saying approximate the time, include all of it- the prep, the actual making, shaping, baking. And yes, count how many times you will have to wash your mixer bowl to switch between cookie batches too. You have to admit, after a while, washing that bowl gets kind of old. So, getting an extra mixer bowl might not be a bad idea either. No. 3. Get an oven that can bake 3+ trays at a time. I realize this is a long shot and you can't get an oven simply because you have to bake cookies. However, this is a big thing to consider when you are buying an oven. If you have a double oven or an oven and a baking drawer- even better. This is a HUGE time saver, not only for baking cookies, but in general. I am not saying it's impossible to bake cookies in other oven, I've done it for years and years, but it is a huge convenience when you have your appliances working with you, not against you. Me personally, I love my GE Cafe C2S985SETSS 30 Freestanding Dual Fuel Range, 5 Sealed Burners, Convection, Baking Drawer but it took me 10 years to save up for it. No. 4. Use recipes that can be customized easily. How many cookies do you really need? Count the people you are giving cookies too and compare the number of cookies you NEED vs. the ones you WANT to make. That way there will be no surprises when you start dividing them between the people you are swapping cookies with. No. 6. Always, always add an extra hour of work to your calculations. No matter what you do, there is always something that will happen and delay your work. Having in mind that you counted that extra hour is the safety cushion you fall back on, when you start panicking you wouldn't finish on time. And as we all know, baking and stress don't go along very well together. No. 7. Take out all of your ingredients ahead of time. First of all, it will give you the opportunity to check one last time if you have everything you need. Just remember the last time you were in the middle of making something and you realized you need an extra of something. Not good, right? Second, having your ingredients at room temperature would save you a lot of trouble ( and stress) when you begin mixing your dough. No. 8. Use recipes for dough that can be stored in the refrigerator overnight. I am not saying use ONLY refrigerator cookies. No. What I am saying is, use recipes that can be stored at least overnight in the freezer or the refrigerator. 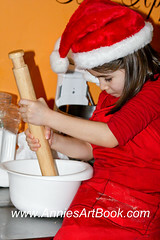 Most of the dough can be stored in the refrigerator, however there are some cookies you simply have to bake right away. Always, always begin your baking with these. Well, because life happens, that's why. You mix up all your dough and you are ready to go then suddenly one of your kids gets sick, or you almost cut your finger, or your boss calls you at the office because there is an emergency, yada yada yada... You know the drill. Waste not, want not as they say, so don't waste any dough, because you didn't plan ahead for an emergency. Therefore, you can mix up your cookies that can be stored in a refrigerator, leave the dough and bake the cookies that have to be baked right away. No. 9. Use trays that fit in your refrigerator. I do not bake cookies on a cooking spray covered tray. No matter what you have heard, it DOES change the taste of the cookie, especially if you bake more than one batch on the same tray unwashed (shudder). How to not go insane between the washing of your mixing bowls, endless spoon and knife armies and baking trays? Parchment paper! Just line up your cookies on a parchment covered cookie tray, bake, then depending on the condition of the partchment paper you can either recycle or reuse it. Ta-da! You just saved 10 minutes! There are really a lot of things you can do, I am just scratching the surface here, but really, the most important one is to use your common sense. - Do not start something you can't finish. - Do get someone to help. - And for Pete's sake, please, please have fun! Do not make the baking of the cookies an ordeal. Make it a memory, something to look forward to, not to dread it with all your soul. After all, nothing makes you work more than having fun, right? 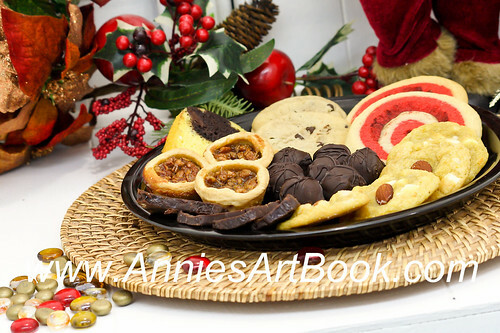 And before you ask, YES- I will post the recipes of these cookies, and YES I left all of the photo equipment in the shot on purpose, just to brag about my MY VERY FIRST CHRISTMAS PRESENT THIS YEAR- my new studio!!! I will tell you all about it very very soon ( or as soon as I manage to recover from overeating with cookies). As you can tell, I finally got a camera remote and you will see me more often in front of the camera, not only behind. But be patient with me, I'm just learning how to work the damn thing properly and it ain't as easy as I thought. It's been a while since I was in front of the camera in a studio ( that's a topic for another time). Until next time, when you will find out what was on my Christmas cookie list for 2012! 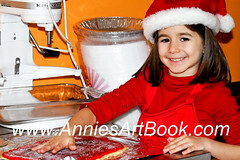 What's on the cookie list for 2012!